Western blot analysis of extracts from untreated, TPA-treated or lambda phosphatase-treated HeLa cells, using Phospho-MEK 1/2 (Ser217/221) Antibody #9121 (upper) or MEK 1/2 Antibody #9122 (lower). Phospho-MEK1/2 (Ser217/221) Antibody detects endogenous levels of MEK1/2 only when activated by phosphorylation at Ser217/221. This antibody does not cross-react with related kinases including activated SEK (MKK4), MKK3 or MKK6. It will also react with MEK1/2 singly phosphorylated at Ser217 and singly phosphorylated at Ser221. Polyclonal antibodies are produced by immunizing animals with a synthetic phosphopeptide corresponding to residues around Ser217/221 of human MEK1/2. Antibodies are purified by protein A and peptide affinity chromatography. 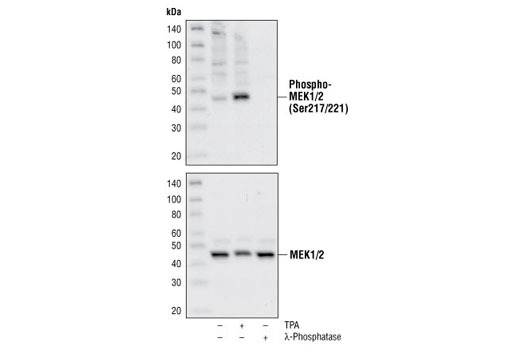 CST's Phospho- MEK1/2 (Ser217/221) Antibody selectively recognizes active MEK, i.e., only when phosphorylated at Ser217/221, and hence is an excellent marker of MEK1/2 activity.